Unless a limited duration is expressly noted in the articles of incorporation, a corporation exists in perpetuity. Therefore, in order to dissolve a corporation, formation action must be taken by the corporation itself, or by others, in order to terminate its existence. Corporations can be dissolved in one of two ways: voluntary or involuntary. 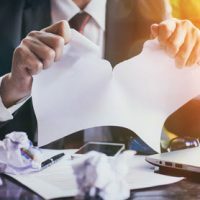 Dissolving a corporation voluntarily is very similar to how other major corporate changes are handled, however it can be tricky so it’s crucial to contact an experienced West Palm Beach business litigation attorney. The board of directors decides on a resolution, which then has to be approved by the corporation shareholders. An alternative to shareholder vote is dissolution without board action by unanimous written consent from every shareholder. After an agreement is reached and the articles of dissolution are filed and approved, it’s time to liquidate assets, pay off all creditors remaining, and distribute any remaining proceeds, if any exist, to shareholders. Shareholders are paid according to their respective ownership percentages and preferences. It’s important to note that the corporation will still exist for a stated period of time after the dissolution to wrap up any remaining corporate business. This means the corporation can continue to file legal actions, but it can also be sued on pre-dissolution claims. At the state level, corporation statutes allow for involuntary dissolution by means of judicial proceedings and decree. In Florida, the governing statute is Florida Statute 607.1430. This sets forth the grounds on which a corporation can be involuntarily dissolved. The corporation has continued to exceed or abuse the authority conferred upon it by law. The shareholders are deadlocked in voting power and have failed to elect successors to directors whose terms have expired or would have expired upon qualification of their successors. The directors or those in control have acted, are acting, or are reasonably expected to act in a manner that is illegal or fraudulent. The corporation has admitted in writing that the creditor’s claim is wrong and owing and the corporation is insolvent. The last option under the statute is a proceeding by the corporation to have its voluntary dissolution continued under court supervision. If you’re facing a corporate dissolution, no matter whether it’s voluntary or involuntary, let an experienced Florida business law attorney help you navigate this challenging process. Contact McCabe Rabin, P.A. at 561-659-7878 or 877-915-4040 for a consultation today.